This section is Under-Edit if necessary: Construction began on November 4, 2009 and was finished on January 11, 2010. Last Update: July 12, 2010, December 3, 2010. The addition of an ADDENDUM to this research paper began on December 3, 2010 and was finished on April 28, 2011. The purpose of this section is to publish/report the results of about 18 months of my investigation into one of the most important problems in science and mathematics: the study and development of accurate analytical and numerical formulations of the Physics of Diffraction, Scattering, and Propagation of Waves as applied to Complex 4-D (Space and Time) physical structures/systems. This endeavor belongs to the field of Computational Mathematical Physics and Engineering. One of the fundamental and key problems of wave theory is the analytical description of the diffraction by edged obstacles. Exact formulations for interesting complex 4-D physical structures do not exist today. The joint application of the solved "canonical problems", the high-frequency theory of diffraction, and the principle of locality has been and is used today. Key to this approach is that the resulting diffracted/scattered fields/waves can be added together at any given location. Depending on the structure of the 4-D object, this approach is not valid. And, these asymptotic methods and their corresponding results can not be accurately verified since the true results can not be obtained analytically. As a result, this problem is one of the most important problems in science and mathematics for obvious reasons. As an example, in Communication Systems, this physics is used to describe the phenomenon of Fading in Mobile Digital Communications. Fading is a serious impairment of Reliable Communications. Other extremely important applications involve devices of Invisibility (stealth) or Detection involving Radar Systems; SuperLens that can operate below the diffraction limit; and Energy (low and high) detectors, converters, and resonators. Why did this highly technical investigation begin? "It turns out that stealth, the greatest challenge ever posed to the air defense systems of the Soviet Union and its client states, was conceived within the Soviet Union itself." Then Mr. Reed goes on about Pyotr Ufimtsev (the Russian scientist), Denys Overholser (Lockheed scientist), William J. Perry (DoD Director and future Secretary of Defense), and the F-117A, the so-called stealth fighter. Mr. Reed on page 205 in referring to Ufimtsev states: "Senior Soviet designers were uninterested in his work...."
How does he know that this extremely important claim is true? Because of my work on a MicroWave Arbitrary Waveform Generator IR&D (Independent Research & Development) project at TRW and for other reasons, I know that something is suspicious with Mr. Reed's assertion that stealth technology, as conceived in the Soviet Union, is truly undetectable. What Mr. Reed claims is unbelievable because the Science does not support it. "Ideas have consequences. Great ideas have far-reaching consequences. The physical theory of diffraction (PTD) Professor Ufimtsev introduced in the 1950s--a methodology for approximate evaluation at high enough frequency of the scattering from a body, especially a body of complicated shape--has proven to be a truly great idea." "In physics and mathematics there are some ideas which open vast horizons in different branches of these sciences. But there are also other ideas which have, so to speak, only local important for some special problems, and are of no value for the application to a larger class of problems. To which of the two kinds belongs the idea considered in this report? Only the future can show this." So is PTD a "great idea" or just of "local important for some special problems" idea? The U.S. government has spent and is spending vast sums of money on the application of PTD in American weapon systems (Lockheed F-117A, Northrop B-2, F-22, etc.) for national security purposes. The total program cost for the F-117A is approximately $7.2 Billion (See Figure 1 and 2 for F-117A photos). Figure 1. F-117A U.S. Stealth Fighter Aircraft (MCAS El Toro Air Show). Figure 2. 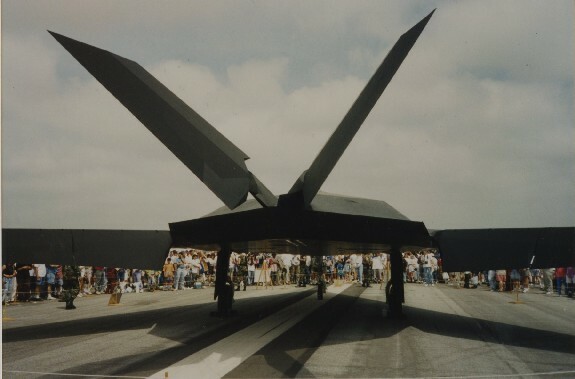 F-117A U.S. Stealth Fighter Aircraft (MCAS El Toro Air Show). Observe in Figure 2 the Shadow characteristics of the F-117A due to Incident Optical Radiation (Sunlight). ADDITIONAL PHOTOGRAPHS of APPLIED TECHNOLOGY in RECONNAISSANCE and WEAPONS PLATFORM AIRCRAFTS: U2 and F-117A. Has this question been settled by an independent party (parties) that has justified this path of stealth or invisibility development using PTD? One must remember that the Scattering and Diffraction electromagnetic phenomenon and theories are extremely complicated and their associated problems have few exact solutions. The mathematical physics describing these electromagnetic problems is extremely complex. Few scientists and engineers have the knowledge to understand the underlying mathematics and physics of scattering and diffraction. Let us see what I have discovered. So let us begin. The format of this discussion consists of the Central Question (& Corollary); Facts drawn from the Documents and Associated Ideas; Key Ideas or Points; Derived Questions; and Conclusions. The documents consist of books and papers that are described below in the List of References. These books and papers will serve as the evidentiary basis for this investigation. Why is the U.S. military stealth (low observable) technology as implemented in current or future deployed (B-2, F-22, etc.) or recently retired (F-117A) weapon platforms based on Soviet scientific research of Pyotr Ufimtsev's Edge Wave Diffraction theory work? Given the nature of the Cold War between the U.S. and the Soviet Union, why would the U.S. civilian and military decision makers trust any "Open literature" in Russian or English publications from the Soviet Union? Initially, if one studies the key publications as described below in the List of References, one will begin to gather evidence that cast serious doubt that the U.S. has chosen the correct path of development of stealth technology. Who is Pyotr Ufimtsev and what is his educational lineage? What is the title of his Ph.D. dissertation and who is his dissertation advisor/chairman? Initially, I have determined that Dr. Ufimtsev was associated with L.A. Vainshtein (Vaynshteyn, Wainstein, Weinstein) in some undefined way. Dr. Vainshtein was a prominent/noted Soviet theoretical physicist and specialist in mathematical physics. Dr. Vainshtein worked at the Institute of Physical Problems (P.L. Kapitsa's institute in Moscow). Dr. Vainshtein was associated with a number of very important scientists in the Soviet Union: P.L. Kapitsa (Nobel Prize in Physics, 1978), Lev Landau (Nobel Prize in Physics, 1962), V.A. Fock, and others. There appears that at least there are two famous schools of Diffraction Theory: Leningrad and Moscow. It appears that Dr. Vainshtein was associated with the Moscow school. FACTS AND IDEAS DERIVED FROM ANALYSIS of DOCUMENTS PART I: No. 2 - 24. FACTS AND IDEAS DERIVED FROM ANALYSIS of DOCUMENTS PART II: No. 25 - 62. FACTS AND IDEAS DERIVED FROM ANALYSIS of DOCUMENTS PART III: No. 63 - 100. This section is a condensation of this investigation's key discoveries and results as presented in the Derived Facts and Ideas from Analysis of the References. Below this presentation is a Summary of the Wave Processes Paper and Book References: Lead Author (Co-Author). Consider the following Key Discoveries and Results. I) One of the basic problems of wave theory is the physical, analytical, and computational description of the diffraction by edged obstacles. Wave processes (and the particle-wave duality) are the basic fundamental phenomena of the physical world as represented by Classical and Quantum mechanical models in many fields of Science, Mathematics, and Engineering. The Wave Processes involve Generation, Boundary interaction, and Reception. One key set of wave processes involve the phenomenon of Electromagnetic (EM) waves as described by Maxwell equations. The phenomena of Diffraction, Scattering, and Wave Propagation, and its associated Physics and Mathematics are very important and involve very technically complex ideas and expressions. 4) the interaction of an EM wave or particle with a potential at the microscopic level of complexity. Few mathematical representations of practical, real EM wave phenomena have analytical closed-form solutions. For this reason, Approximation theory and Computer-based Numerical approaches are applied in an attempt to arrive at some fairly accurate (??) result but are limited by their own drawbacks. And, the experimental approach of empirical measurement for these wave phenomena has their own difficulty and costs. The Electromagnetics, Optics, and Mathematical Physics books that were used as technical references for this investigation provide a deep understanding of the nature and complexity of Wave Processes including Diffraction. The book Guiding, Diffraction, and Confinement of Optical Radiation by S. Solimeno, B. Crosignani, and P. Di Porto provided an excellent source for knowledge on Diffraction Theory and its associated physical and mathematical descriptions . What is amazing is there is only one reference to Ufimtsev's work [1971 translated PTD monograph (1962 Russian version)] with no description of PTD in the book's text. The book Classical Electrodynamics by J. D. Jackson provided a deep insight into abstract EM theory and EM wave boundary interaction . The book Fields and Waves in Communication Electronics by S. Ramo, J.R. Whinnery, and T. Van Duzer provided an excellent insight into EM from a Communications Electronics perspective . The book Electromagnetic Fields and Waves by V. Rojansky provided a very straightforward insight into EM theory . The book Mathematical Methods for Physicists by G. Arfken provided a great mathematical foundation for the study of scattering and diffraction . The books Optics by E. Hecht and A. Zajac  and Optics M.V. Klein and T. E. Furtak  provided a great description of the diffraction of light, an extremely high frequency EM phenomena. II) The importance of EM Wave processes has been recognized by the scientific and technological communities for quite long time. Many important scientists, mathematicians, and engineers have invested their lives in the study of EM Wave processes in a number of countries in Europe (Germany, UK, Italy, Denmark, Poland, Russia, Soviet Union, etc.) and in the United States. The Soviet Union leadership understood the importance of the Applications of the Science and Mathematics of Wave Processes. Many Russian and Soviet scientists, engineers, and mathematicians were and are leaders in developing fundamental understanding and applications in this field pertaining to Ultra-high frequency electronics, High-Power Electronics, Wave (Signal) Theory for Generation, Propagation, and Scattering/Diffraction, Radars, Resonating Structures and Lasers, Plasma Theory, and Energy Generation, etc.). Pyotr Yakovlevich Ufimtsev was one of many brilliant scientist, engineers, and mathematicians in the Soviet open and defense research institutes. It appears that Dr. Ufimtsev while in the Soviet Union was associated with two of the most important and distinguished Soviet physicists: Academician Vladimir Aleksandrovich Fock and Lev Al'bertovich Vainshtein. How these associations occurred is a mystery. In the Ufimtsev's 2003 book on Physical Theory of Diffraction (PTD), he acknowledges V.A. Fock's contributions and states that Dr. Fock recommended that a book be written on PTD (~30 year before) . Ufimtsev's PTD appears essentially to be an expression of the Electromagnetic Finite Element approach . Paraboloid of revolution : wedge. Also, what is most interesting is that somehow he got connected with another premier physicist in the Soviet Union: L.A. Vainshtein. In the same 2003 PTD book, Dr. Ufimtsev states that "the focus and character of this research were largely influenced by a long-term scientific communication with L.A. Vainshtein" . And, Dr. Vainshtein wrote the Foreword in Ufimtsev's 1962 PTD Russian monograph . Dr. Vainshtein was an associate (close ?) of P.L. Kapitsa who received the Nobel Prize in Physics in 1978. Dr. Vainshtein worked at the Institute of Physical (Physics) Problems in Moscow until he passed away in 1989 (~one year before Ufimtsev left the Soviet Union). P.L. Kapitsa was probably one of the most powerful scientists in the Soviet Union before his death in 1984. Academician Kapitsa created the Institute of Physics Problems with the support of Stalin in 1934. L.A. Vainshtein, a graduate of Moscow State University, was a theoretical physicist and a brilliant expert in Electrodynamics, Resonators and Waveguides, Signal Theory, High Power Electronics, and Scattering and Diffraction Theory. From Ufimtsev's 2003 PTD book, we learn that in 1956 and 1957 Ufimtsev worked supposedly at the Central Research Radio Engineering Institute in Moscow (1954-1973) . From Vainshtein's obituary paper we learn that between 1946 to1957, Vainshtein work at a defense institute (location not disclosed) and between 1957 to1989, Vainshtein worked at the Kapitsa's Institute . Now, supposedly, the initiation of the idea of the PTD by Ufimtsev is found in four Russian papers that were published in the late 1950s in the Journal of Technical Physics of the USSR. The English translation is found in the Soviet Physics-Technical Physics [20, 21, 22, 23]. Ufimtsev's first paper  and fourth paper  were received by the Soviet journal house on 7/30/56 and his second and third papers  &  were received on 3/25/57. The fourth paper states that Vainshtein directed the work in this paper. And, second and third papers thanked Vainshtein for his guidance. It is clear that these papers are very important and valuable because of Vainshtein's association with them. Also, in the second paper on secondary (& tertiary) diffraction, the first indication of Ufimtsev's interest in Radar diffraction appears [angle parameter (s) specification for Radar]. Note that Ufimtsev's translated 1962 Russian monograph on PTD clearly indicates Vainshtein and Ufimtsev's interest pertaining to Diffraction in Radar applications . Also, it is very important to realize that during the time of the work represented by these four Ufimtsev papers, Vainshtein was working at a defense institute. In 1956, the work of this Soviet defense institute would likely been classified and obviously this work would never be published in the open literature unless it had been censored, modified, and/or edited. And, any paper that Ufimtsev would have wanted to publish in the open Russian literature would have had to be approved by authorities other than Vainshtein. Thus an open question remains. Who and what approval process was involved in these four papers in Moscow during the time of publication (1956-1958)? III) The Cold War between the Soviet Union (USSR) and the United States (U.S.) motivated the US to develop advanced Reconnaissance and Weapon Systems (aircraft) with Very Low Observability (VLO) to be used against the Air Defense Systems Radars in the USSR. A question of uppermost importance of this technological struggle by USSR and U.S. pertains to the dual problems of detection of an airborne target or evade detection of the airborne target. Which problem is harder to solve? Note that in the 1920-30s, the USSR developed a Radar System (Pulsed L-Band). During WWII, the Soviet used Western radar systems. After the war, the Soviets used Enhanced Western radar against the U.S. over flights of the USSR . And, in response, the USSR developed advanced Radar systems that were applied against reconnaissance missions into the USSR. 2) to develop flexible iterative computer-based tools for the prediction and measurement of a RCS of a proposed stealth aircraft design. In the Spring of 1975, the DARPA goals of RCS signature levels are established by McDonnell Douglas and Hughes for the VLO military aircraft. McDonnell Douglas was the first to arrive at the required signatures levels which was later confirmed by Hughes Radar experts . So the U.S. began that search by contracting for Scattering and Diffraction research and development of such RCS prediction and measurement tools (1960s & 1970s). University of Michigan (UM) Radiation Laboratory (RL) was and is one of these centers of Electromagnetic research. UM's T.B.A Senior and his associates have published many studies, reports, and books. Dr. Senior studied PTD and appeared to raise valid criticism of Ufimtsev's theory . K.M. Mitzner and Northrop were also involved in this research. Dr. Mitzner's 1974 report on "Calculation of Radar Cross Section" described their work that took place between December 1970 and June 1973. In this work, he investigates P.Y. Ufimtsev's PTD and develops a semi-automated system for computing RCS using PTD. Thus, Northrop was developing the analytically capability to develop Low Observable (LO) aircraft and by 1974 it had built a second generation RCS prediction computer program . In case of Lockheed, the creator of the 1950s reconnaissance aircraft U2, this company had not developed an analytical capability to develop LO aircraft. Its designs were based on the intuition or empirical rule-of-thumb. Lockheed did not start to develop this capability (ECHO computer program) until the XST/Have Blue proposal (Spring 1975). Lockheed's Denys Overholser did not become aware of Ufimtsev's PTD until sometime after the initial development of ECHO. Ufimtsev PTD was not used until the subsequent Lockheed's design of the Stealth Fighter, the F-117A . What is amazing is that Lockheed won the contract in April 1976 to ultimately design and build the F-117A. This decision was made supposedly because even though both faceted designs (Northrop's and Lockheed's) were similar and had a very low RCS, Lockheed won because it had the capability to produce special treatment edges. Ufimtsev's PTD was used in the design of the F-117A . It is most likely that Lockheed used Ufimtsev's work of Physical Theory of Diffraction to correct the proposed design of the F-117A given its parent prototype aircraft's aerodynamic flight problems while attempting to achieve the necessary Low Observability requirements. An Enhanced ECHO or similar computer program would have been used in the aircraft/airframe design for the tradeoff of the flight characteristic and RCS. Given a Very Low Observable Requirement for a novel tactical combat military aircraft, a RCS design that would be based on an Intuition or empirical rule-of-thumb approach would probably not achieve this result. But a RCS prediction computer program that would have implement Ufimtsev's PTD would have required "Ad hoc" matching functions or some systematic method for obtaining the higher order diffraction effects. This observation is based on E.F. Knott and T.B.A. Senior's November 1974 paper  and Dr. Senior's 1977 report . Even though Lockheed won the Stealth Fighter selection battle and received the contract for the design and build of the F-117A, Northrop did not lose either. DARPA wanted the Northrop XST team to stay together and maintain their stealth development expertise. Northrop continued their RCS studies where eventually the company received DARPA funding (1976-1978). Northrop became the prime contractor for the DARPA's TACIT BLUE program for a Very Low Observable Reconnaissance aircraft. The TACIT BLUE program produced data for subsequent B-2 stealth bomber. In 1981, Northrop won the advanced technology bomber development contract . K.M. Mitzner was one of the architects of the Northrop's Stealth Bomber, B-2. Dr. Mitzner in the Foreword of Ufimtsev's 2003 and 2007 PTD books extols Ufimtsev��s work of Physical Theory of Diffraction and its contributions to the development of the B-2 . Note that the B-2 was developed from 1981 to 1989 when its first flight took place in July 1989. This so-called Stealth Bomber has cost the American taxpayers about 45 billion dollars for twenty one aircraft. While the B-2 is being developed by Northrop, an USAF Second Lieutenant U.J. Macias was doing research on PTD and other RCS prediction technologies for his M.S. Thesis  at the Air Force Institute of Technology (AFIT). The chairman of this thesis is Andrew J. Terzuoli. Macias discovered that the Physical Theory of Diffraction and the Physical Optics approximation are relatively inaccurate . The Method of Moments was most accurate RCS prediction method. The same A.J.Terzuoli is the Editor for Ufimtsev's 2003 PTD book. Ufimtsev was a guest Professor at AFIT in 1994 and 1999 . It is interesting to note that in the mid-1980s, Lockheed started to apply the Method of Moments (MoM) to the problem of predicting analytically the performance of special edges . Another amazing fact is that Ufimtsev has actual personal involvement in U.S. military technology development. In his December 1996 paper, we learn from this paper how much Ufimtsev is informed about Radar Cross Section reduction techniques and diffraction principles. In this paper, he says Diffraction is another word for Scattering. Ufimtsev appears to be quite an expert in this field, much more than a theoretical mathematical physicist. There are 214 references: Soviet as well as non-Soviet contributors. Here we learn that he left Soviet Union in 1990, went to UCLA and then became affiliated with Northrop-Grumman . Northrop is the developer of the B-2 Stealth Bomber, a highly classified project. One must remember that during the Cold War the purpose of the B-2, a First Strike Weapon, was to destroy the Soviet Union, Ufimtsev's homeland. Today, the B-2 is still a First Strike Weapon. Dr. Ufimtsev claims that the Physical Theory of Diffraction can be applied to cases of Electromagnetic Wave and Acoustic Wave Scattering or Diffraction through the application of Elementary Edge Waves (EEWs) . Dr. Ufimtsev's 2003 book on PTD is an attempt to convince the Electromagnetics scientific and engineering community of the validity of the Physical Theory of Diffraction. Again, Dr. Ufimtsev's 2007 book on PTD is an attempt to convince the Electromagnetics and Acoustical scientific communities of the validity of the Physical Theory of Diffraction. What is interesting is that in his 2007 book as contrast to his 2003 book, there is no acknowledgement of Professor Fock's and Dr.Vainshtein's contributions to the work of PTD. And, then, we have the presentation of another Soviet idea: the Method of Virtual Rays in another American paper by Ufimtsev as a co-authored with N.G. Alexopoulos, et al in 1994 . No physical justification for this Method of Virtual Rays is presented nor is there any mention of PTD in this paper. This Virtual Rays concept was created in 1969 by Yu. I. Orlov in his doctoral dissertation. L.A. Vainshtein worked with this concept for Plasma wave diagnostics in 1976 . Currently (2010), the U.S. via Lockheed has developed additional stealth fighter aircraft, the deployed Lockheed' F-22 Raptor and the future deployed Lockheed Martin F-35 Joint Strike Fighter. Note that Everest E. Riccioni has revealed major issues and problems (i.e., Limited direction radar evasion) with the F-22, the second generation U.S. Air Force stealth fighter aircraft . So an important question to be asked given Lockheed's past use of the Physical Theory of Diffraction is to what degree of stealth development of these aircraft can be attributed to Ufimtsev's or other associated Soviet ideas? Finally, a coming revolution in Invisibility and Stealth technology is the development of "Negative index material" as discussed in the V.G Veselago's 1964 Russian paper . This landmark paper provides the basis for future research on development of materials and devices of Stealth, Invisibility, and SuperLens. 1. Why does Professor Ufimtsev think that his PTD concept of Edge Waves is unique and novel? He formulated that the "ad hoc" defined fringe currents (surface currents) in perfectly conducting material exists and produce edge waves (his 1st Russian paper published in Soviet Union in 1957). What is the edge wave formulation when the material has finite conductivity. He tries to explain diffraction in acoustic (elastic waves)-based system in the same way: edge waves. What is the fringe currents analog (physical entity) in these non-Maxwell Electromagnetic-based systems? Elastic waves in acoustic material are longitudinal waves. Electromagnetic waves in dielectric material are transverse waves. No conduction currents. Displacement or polarization currents exist. Elastic waves in fluids (water & gases) can be transverse or longitudinal waves. There are no induced surface currents (as analog to electrical current, source of a field). Transverse wave: vibration is perpendicular to the direction of energy flow or propagation. Longitudinal wave: vibration is in the same direction of the energy propagation (compression & relaxation). Dr. Vainshtein worked with edge wave diffraction in Open Resonator and Open Waveguides in the 1950's (probably with Dr. Fock). Concept of acoustic edge wave was probably known for a long time: physics of "pipe organ" physics. 2) Why does Professor Ufimtsev use the term "high-frequency" when in actuality he has wave number k approach infinity (k → ∞) where k is equal to 2π/λ where λ is wavelength. When k → ∞ with λ → 0, the diffraction phenomenon ceases to exist. Sharp boundaries between lit and shadow areas will exist where the pure Geometric optics model is valid (ray optics model). 3. How does Professor Ufimtsev know his PTD predictions (approximations) are correct/accurate given the fact that few analytical solutions can be determined for practical realizable complex shaped scatterer structures? 4) Why does Professor Ufimtsev work only with deterministic parameters in his asymptotic expansion of Diffraction integrals for PTD? In fact, the position of the aperture (s) or obstacles (s) will be time-varying or not fixed and is unknown to the observer or reference. In effect, we have a three dimensional Spatial Random Process/Random Field Problem. 5. Why does Professor Ufimtsev believe his "uniform" and "nonuniform" surface fields model (s) is correct given the fact that the incident wave and complex (or simple) body's surface relationship will be time varying? Each position on the body will have a different "uniform" part and "nonuniform" part of surface current that is dependent on vibrational characteristics of the body and coherency of the incident wave. There is actually a stroboscopic effect here that depends on the incident waveform frequencies and vibrational characteristics of the body. How does the finite element model of a static wedge (edge or curve) change given a time varying incident energy- body interaction? 6. How does Professor Ufimtsev's first order diffraction model (s) handle the cases where the incident energy is composed of multiple electromagnetic waves (a polychromatic field) where each wave is described by its own ith wave number ki? A polychromatic field is a superposition of a number (set) of monochromatic waves. Assume linear diffraction process and Huygens' principle. What if these assumptions are not true? 7. How does Professor Ufimtsev's nth-order diffraction model (s) handle the cases where the incident energy is composed of multiple electromagnetic waves (a polychromatic field) where each wave is described by its own ith wave number ki? Assume linear process and Huygens' principle. What if these assumptions are not true? 8. Why does Professor Ufimtsev appear to be changing his approach in determining the diffraction or scattering field from the initial concept (PTD) or "Electromagnetic (EM) finite element" method to the application of Virtual Rays? The Ufimtsev 1957 Russian paper  introduced the idea of an "EM finite element" method along with the concept of a fringe field due to a "nonuniform" current density caused by a discontinuity (edge)'s perturbation of an incident plane EM wave. In a 1994 "Virtual Rays and Applications" paper is published in U.S. (Ufimtsev is a co-author) . In this paper, there is no physical justification of circular rays and no reference to PTD. Circular rays or non-straight line rays can exist in Inhomogeneous media where the refractive index varies with position (special conditions) (e.g., lower-frequency example of radio waves in ionosphere) . In a 1997 Comment paper  by Ufimtsev, we learn of an earlier work that was published in the Soviet Union in 1982 between L.A. Vainshtein and himself. One of the great dreams of mankind is how to become invisible. H.G. Wells in 1897 wrote a novel titled The Invisible Man. This book tells a story about how an Englishman (Mr. Griffin, a brilliant former medical student) becomes invisible but can not revert back to visibility, the interaction of locals with him, the man's insanity, and his eventual death. And, in end, what remains is the partially destroyed notes (in Russian and Greek) containing Mr. Griffin's invisibility formula. The machine form of Invisibility has played a very large role in the survivability of countries during the time of war. We have had and do today the Problem of Reliable Detection of Airborne Targets and its dual problem of the Ability to Reliably Evade Detection of Airborne targets. This Invisibility property involves a set of some of the most fundamental phenomena that exists in the physical Universe: Wave Processes of Propagation, Scattering, and Diffraction. One of the basic problems of wave theory is the physical, analytical, and computational description of the diffraction by edged obstacles. The generation of waves processes and the duality of particle and wave are extremely important phenomena, too. Electromagnetic, acoustic, and elastic waves surround us in our everyday lives. Our visual and auditory reality is totally dependent on Wave Processes and our biological mechanisms to respond to these processes. The USSR invested in the Detect part of the Radar Application by developing Advanced Radar Systems for their Integrated Air Defense System (reversed engineering of Lend-Lease Radar Systems or developed their own advanced Radar Systems). The Soviet shared some of these Air Defense Systems with their allies. The U.S. then decided to invest in the Evade part of the Radar Application by developing stealth technology (initially for reconnaissance aircrafts for over flights of USSR). The U.S. wanted to develop a tactical combat aircraft and a first strike weapon (strategic bomber) that would destroy the Soviet Union or any other enemy that might arise (a reaction to the Vietnam War and Yom Kippur War). The Lockheed F-117A Stealth Fighter was planned to be a tactical airborne weapon and the Northrop B-2 Stealth Bomber became the strategic airborne weapon. In reality, because of the proposed stealth capability, both aircraft are in fact first strike weapons. Also, it is remarkably clear that the scientists, mathematicians, and engineers of the Soviet Union (&Russia) was and are pioneers in the fields of Electromagnetics (EM), Physics of High-Power Radiation, Physics of Plasma, Physics of Diffraction and Scattering, Advanced Mathematical Physics, and Applied EM Engineering. The CIA probably and the U.S. Air Force (USAF) scientific and engineering personnel were acquiring and studying Russians publications and documents (open literature or probably stolen papers or reports) from the Soviet Union in the 1950s, 1960s, 1970s, and probably now. The U2 reconnaissance flights took place over the Soviet Union during the Cold War. So knowledge of how the U2 could evade the Soviet radar and its air defense systems would be invaluable to the U.S government and Lockheed, the designer of the U2 and other surveillance aircraft. What is important to understand is that the underlying Physics, Mathematics, and Engineering of Wave Processes of Diffraction, Scattering, and Propagation are technically very difficult to understand and analyze. To create new profound ideas, research, novel devices, the inventor needs to be brilliant and probably a genius. Advanced EM mathematical physics developed in the Soviet Union could only be understood and critiqued by very few scientists or engineers in the West or in the U.S.
One of those U.S. individuals was/is Professor Thomas B.A. Senior, Applied Mathematician and Radar expert who is associated with the University of Michigan Radiation Laboratory. There are other EM experts such as Professors J.B. Keller, E. F. Knott, J.J. Bowman, P.L.E. Uslenghi, R.G. Kouyoumjian and P.H. Pathak, R. Mittra, and S.W. Lee in the U.S. and in other Western countries. Now, in the Soviet Union, brilliant scientists and engineers have made major contributions to the above described scientific fields. Such as Petr Leonidovich Kapitsa, Lev Landau, Vladimir Aleksandrovich Fock, Mikhail Aleksandrovich Leontovich, G.D. Malyuzhinets, Lev Al'bertovich Vainshtein, and many others. Numerous Nobel Prizes in Physics have been awarded to EM scientists in the Soviet Union. In the Soviet Union and Russia there exists at least two Schools of Diffraction Theory: Leningrad and Moscow, the ones that are the most famous for their scientific contributions. And, of course, we have learned of Pyotr Y. Ufimtsev, the creator of the "Physical Theory of Diffraction" (PTD). Former Secretary of Air Force Mr. Reed, Dr. K.M. Mitzner, and others associated with the defense industry extol the virtues of PTD and Dr. Ufimtsev  . Obviously, there is no doubt that Professor Ufimtsev was a very important scientist in the Soviet Union and in the Moscow community of EM research. Of course, this would be true given his association with L.A. Vainshtein, one of the associates of P.L. Kapitsa at the Institute of Physical Problems. Professor Ufimtsev appeared in the Soviet EM community with the publication of his four PTD papers in the Russian open literature in 1957 and 1958 [20 - 23] and of his Russian PTD monograph in 1962. In 1971, this Russian monograph was machine translated into English by the USAF Foreign Technology Division (FTD) . Sometime in 1970s, the U.S. government, USAF, and defense contractors (Northrop, Lockheed, and probably others) started down the path of application of Scattering and Diffraction Theory based on PTD to develop a stealth aircraft of minimum possible Radar Cross Section given the Soviet Radar capabilities. The purported claim is that this 1971 translated PTD monograph started the PTD application to the development of U.S. stealth aircraft weapon systems (Lockheed F-117, Northrop B-2)  . While the U.S. government, Lockheed and Northrop were going down this PTD application path, T.B.A. Senior was receiving U.S. grant money to provide his expertise to USAF and publish papers on his studies on PTD and other scattering/diffracting modeling approaches . While this is going on in U.S., Professor Ufimtsev in the Soviet Union is corresponding with Professor Senior pertaining to his researches and Dr. Senior's critique of Ufimtsev's work . It is important to remember that practical realizable complex scattering and diffracting object's radiation patterns can not be determined analytically (i.e., no closed form solutions) according to today's state of knowledge of this phenomena and mathematics. Attempts to approximate these radiation patterns are arrived at with clever mathematical tricks and the fundamental assumption of High-Frequency incident radiation, the Principle of Locality, and the Principle of "Canonical Problems." This Approximate approach is used because the scattering or diffraction integrals have no closed form solutions and supposedly numerical solutions require very advanced computing machines. The numerical approach has problems related to series convergence and other complexities that dictate the required capabilities of the high speed computing engine. Supposedly, the Soviets did not have access to computing engines that were comparable to the U.S. technology in the 1950s, 1960s, and the 1970s. But the Soviets scientists did have access to computers. The Kapitsa's Institute in Moscow would probably have had access to the best computer systems in the USSR. But the U.S. appears to have chosen Ufimtsev's work of PTD which is essentially an "EM Finite Element" Method (based on the High-frequency "Asymptote" and "Ad hoc" Interpolating/Matching Functions) and to have spent at least fifty two (52) billion dollars for the F-117A, B-2 aircraft, and other weapons systems. And, if one understands the fundamental nature of PTD, one can see the fundamental flaw in this method. This flaw exists because the underlying key assumption is that the perfect conducting or dielectric/ferromagnetic or other type of polymer coated complex shaped object is irradiated with a wave of high frequency or wave number that approaches infinity (or the wavelength is much smaller than certain "element" dimensions of the body). But what would be the Radar Cross Section of this complex object when it is irradiated with a range of certain "signature" wavelengths, wave shapes, amplitudes, and polarizations. In a scattering or diffracting complex body (Perfectly conducting or dielectric) with discontinuities (edges, vertices, jumps, etc. ), there are many waves processes occurring such as multiple orders of diffraction where the non-plane waves exist; surface and creeping waves; and resonating waves in de facto open resonators and waveguides. So the question remains, are there other paths of advanced understanding and development of EM phenomena that deal with Transmitting and Receiving Antennas, Scattering and Diffraction, and, of course, Stealth or Invisibility? I believe the answer is "Yes". The Soviet and Russian non-Ufimtsev papers reveal that these authors are working on their own path of researches that have nothing to do with PTD or Ufimtsev. Basically, the methods used to solve diffraction problems are current-based or field-based. PTD as an extension of Physical Optics uses a current-based method along with "ad hoc" matching functions. The other papers' diffraction solutions are field-based. Note the concept of Virtual Rays was introduced in the U.S. in a 1994 paper (a Soviet idea by Yu I. Orlov in his Ph.D dissertation in 1969) . Ufimtsev was a co-author on this paper. But Academician V.A. Fock worked with induced currents; Academician M.A. Leontovich worked with surface currents; Dr. Vainshtein worked with current, electron waves, or current waves; and P.L. Kapitsa worked with plasma, charged ions. These brilliant or genius Soviet physicists were working with current not field. L.A. Vainshtein was directing and/or guiding Ufimtsev in the work for the original 1957 and 1958 papers' researches based on surface currents (uniform and nonuniform) induced by plane waves incident on perfecting conducting simple geometric shapes. So Dr. Vainshtein may have been exploring one path of research with Ufimtsev while envisioning others paths of potential solution. In these first Ufimtsev Russian papers of the 1950s, he invokes the Principle of Reciprocity or claims that his formulas satisfied the Principle of Reciprocity. Simon Ramo in his 1984 and 1994 EM books discusses the Principle of Reciprocity and its validity . "We were trained never to use uncontrollable approximations. Landau would kill anyone who was using them." "The only relevant model, you cannot solve. You have to wait for a new generation of machines." So did this incredibly brilliant associate of the great experimental physicist Dr. P.L. Kapitsa, Dr. L. A. Vainshtein envision another path of research that would apply in a novel way the concepts of oscillating currents and fields and the Principle of Reciprocity to arrive at another "Asymptote" approach or closed form solution to the Problem of Diffraction or Scattering by a Generalized Complex body with discontinuities. If so, who is working on it right now in Russia, Ukraine or China? Who is carrying on Dr. Vainshtein's work in Russia? To further complicate this Conclusion, one must not forget a completely different approach in creating or controlling Invisibility that was created in the Soviet Union in 1964. This truly unique approach is found in the work of Dr. V.G. Veselago as expressed in his 1964 landmark Russian paper . Today, we see part of his vision in the creation of metamaterials and the SuperLens proof-of-concept implementations in nanotechnology. So in closing, it appears that the Physical Theory of Diffraction (PTD) is not "a great idea" but is in fact of "local important for some special problems" idea. Also, it appears that no independent party has justified the correctness and reliability of the PTD path of stealth. The University of Michigan Professors E.F. Knott and T.B.A Senior in 1974 appears to raise valid criticism of PTD . In fact, an Air Force officer working on a M.S. at the Air Force Institute of Technology found PTD relatively inaccurate in 1986 . Further, German electromagnetics experts Dr. U. Jakobus and Dr. F.M. Landstorfer called into question the validity of PTD in terms of its practical implementation in their 1995 paper  and 1997 reply  to Ufimtsev's 1997 comments . Further, the Central Question (& Corollary) can not be answered here of why the U.S. government would trust the stealth technology [i.e., first strike weapon systems (Stealth Fighter & B-2 Stealth Bomber)] that is supposedly derived from the Cold War open literature of a Soviet scientist to safeguard the U.S. national security. And, given Lockheed's past application of PTD, what is the integrity of the stealth development for the currently deployed Lockheed F-22 Raptor and the future deployed Lockheed Martin F-35 Joint Strike Fighter? Everest E. Riccioni has revealed major issues and problems with the F-22, the second generation U.S. Air Force stealth fighter aircraft . And, while pursuing this quest for this so-called stealth weaponry, the U.S. has expended 52 plus billions of taxpayer dollars. So the Answer remains a "Secret" and will probably remain a "Secret." William J. Perry, Paul G. Kaminski, and other current and former government workers (such as John S. Foster, Jr., etc.) probably know the answer to this question. And, the Russian government may know the answer, too. An ADDENDUM to this "Research on Problems of Diffraction, Scattering, and Propagation of Waves" paper has been added to this website. Consult this ADDENDUM to Learn more about important matters pertaining to Edge Diffraction and Singularity. CLICK here for the ADDENDUM. Thomas C. Reed, AT THE ABYSS An Insider's History of the Cold War, Ballantine Books, New York, UCI Main Library: D843.R37 2004. Pyotr Ya. Ufimtsev, Fundamentals of the Physical Theory of Diffraction, UCI SL: QC665.D5 U35 2007. Pyotr Ya. Ufimtsev, Theory of Edge Diffraction in Electromagnetics, UCI SL: QC665.D5 U35 2003. Transformation and Transition: DARPA's Role in Fostering an Emerging Revolution in Military Affairs, Volume 1 - Overall Assessment, April 2003. Cracks in the Black Dike Secrecy, the Media, and the F-117A, Airpower Journal, Fall 1991. 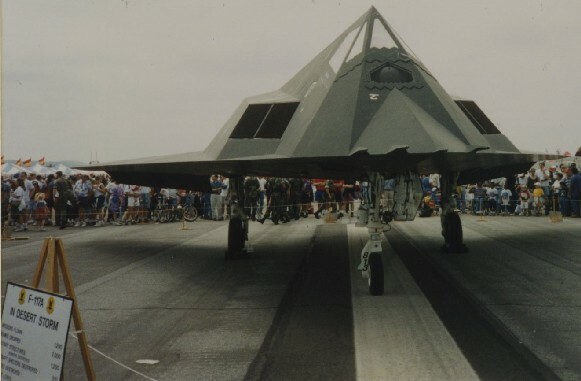 David C. Aronstein and Albert C. Piccirillo, Have Blue and the F-117A: Evolution of the "Stealth Fighter", American Institute of Aeronautics and Astronautics, Inc., UCI SL: TL671.2.A624 1997. Everest E. Riccioni, "Overblown 'Raptor' Would Plunder Budget", Los Angeles Times, August 14, 2001. Philip F. Panter, Communication Systems Design: line-of-sight and tropo-scatter systems, UCI SL: TK6553.P263 1982. S. Solimeno, B. Crosignani, and P. Di Porto, Guiding, Diffraction, and Confinement of Optical Radiation, Academic Press, Inc., 1986. J.J. Bowman, T.B.A. Senior, and P.L.E. Uslenghi, Electromagnetic and Acoustic Scattering by Simple Shapes, North-Holland Publishing Company-Amsterdam, UCI SL: QC670.E39 1969. K.M. Mitzner, "An Integral Equation Approach to Scattering From a Body of Finite Conductivity", Radio Science, Vol. 2 (New Series), No. 12, pp. 1459-1470, December 1967. John David Jackson, Classical Electrodynamics, Second Edition, John Wiley & Sons, 1975. Vladimir Rojansky, Electromangetic Fields and Waves, Dover Publications, Inc., 1979. Simon Ramo, John R. Whinnery, and Theodore Van Duzer, Fields and Waves in Communication Electronics, Second & Third Editions, John Wiley & Sons, 1984 & 1994. George Arfken, Mathematical Methods for Physicists, Third Edition, Academic Press, Inc., 1985. Eugene Hecht and Alfred Zajac, Optics, Addison-Wesley Publishing Company, Inc., 1974 (4th Printing Feb. 1979. A. Rubinowicz, "The Miyamoto-Wolf Diffraction Wave", Progress in Optics, Vol. 4, pp. 199-240, 1965. Miles V. Klein and Thomas E. Furtak, Optics, Second Edition, John Wiley & Sons, Inc. 1986. K.M. Mitzner, "Incremental Length Diffraction Coefficients", Northrop Corp., Aircraft Division, Technical Report, Report Date: April 1974, 143 pages, Air Force Avionics Laboratory, Doc. ID. No. AFAL-TR-73-296, Wright-Patterson AFB, Ohio, April 1974. P. Ia. Ufimtsev, "Approximate Computation of the Diffraction of Plane Electromagnetic Waves at Certain Metal Bodies. I. Diffraction Patterns at a Wedge & a Ribbon. ", Soviet Physics - Technical Physics, Vol. 2, Pt. 2, No. 8, pp. 1708-1718, August 1957. P. Ia. Ufimtsev, "Secondary Diffraction of Electromagnetic Waves by a Strip", Soviet Physics-Technical Physics, Vol. 3, Pt. 1, No. 3, pp.535-548, March 1958. P. Ia. Ufimtsev, "Secondary Diffraction of Electromagnetic Waves by a Disk", Soviet Physics-Technical Physics, Vol. 3, Pt. 1, No. 3, pp.549-556, March 1958. P. Ia. Ufimtsev, "Approximate Calculation of the Diffraction of Plane Electromagnetic Waves by Certain Metal Objects. II. The Diffraction by a Disk and by a Finite Cylinder. ", Soviet Physics - Technical Physics, Vol. 3, Pt. 2, No. 11, pp. 2386-2396, November 1958. P. Ya. Ufimtsev, "Method of Edge Waves in the Physical Theory of Diffraction", (from the Russian "Metod krayevykh Voln v Fizicheskoy Teorii Difraktsii," Izd-Vo Sovetskoye Radio, pp. 1-243 ), monograph translation prepared by the U.S. Air Force Foreign Technology Division, Doc. ID No. FTD-HC-23-259-71, Wright-Patterson AFB, Ohio; released for public distribution Sept. 7, 1971. Leopold B. Felsen and Georges A. Deschamps, "Scanning the Issue, Special Issue on Rays and Beams", Proceedings of the IEEE, Vol. 62, No. 11, pp. 1412-1415, November 1974. Eugene F. Knott and Thomas B.A. Senior, "Comparison of Three High-Frequency Diffraction Techniques", Proceedings of the IEEE, Vol. 62, No. 11, pp. 1468-1474, November 1974. Vladimir A. Borovikov and B. Ye. Kinber, "Some Problems in the Asymptotic Theory of Diffraction", Proceedings of the IEEE, Vol. 62, No. 11, pp. 1416-1437, November 1974. P.C. Clemmow, "Edge Currents in Diffraction Theory", IEEE Transactions on Antennas and Propagation, Vol. AP-4, pp. 282-287, July 1956. Robert G. Kouyoumjian and Prabhakar H. Pathak, "A Uniform Geometrical Theory of Diffraction for an Edge in a Perfectly Conducting Surface", Proceedings of the IEEE, Vol. 62, No. 11, pp. 1448-1461, November 1974. Peter L. Christiansen, "Comparison Between Edge Diffraction Processes", Proceedings of the IEEE, Vol. 62, No. 11, pp. 1462-1468, November 1974. "The Equivalent Current Method" by T.B.A Senior, Report No. RL-610, 1975. "STUDIES IN DIFFRACTION" by T.B.A Senior, FINAL REPORT Prepared for: AIR FORCE OFFICE OF SCIENTIFIC RESEARCH, Report No. 011075-1-F, 1977. Peter Ya. Ufimtsev, 'Comments on "Comparison of Three High-Frequency Diffraction Techniques"', Proceedings of the IEEE, Vol. 63, No. 12, pp. 1734-1737, December 1975. Pyotr Y. Ufimtsev, "Comments on Diffraction Principles and Limitations of RCS Reduction Techniques", Proceedings of the IEEE, Vol. 84, No. 12, pp. 1830-1851, December 1996. Pyotr Y. Ufimtsev, 'Corrections to "Comments on Diffraction Principles and Limitations of RCS Reduction Techniques"', Proceedings of the IEEE, Vol. 85, No. 3, pp. 475, March 1997. G.D. Bogomolov, A.V. Gaponov-Grekhov, P.L. Kapitza, S.P. Kapitza, E.L. Kosarev, V.A. Kotel'nikov, A.B. Manenkov, and V.N. Melekhin, "Lev Al'bertovich Vainshtein (on his sixtieth birthday), Sov. Phys. Usp., Vol. 23, No. 12, pp. 878-879, December 1980. A.F. Andreev, G.D. Bogomolov, A.S. Borovik-Romanov, S.P. Kapitsa, A.I. Kleev, A.B. Manenkov, V.N. Melekhin, L.P. Pitaevskii, G.P. Prudkovskii, and S.I. Filimonov, "Lev Al'bertovich Vainshtein (Obituary), Sov. Phys. Usp., Vol. 33, No. 4, pp. 305-306, April 1990. From Les Prix Nobel. The Nobel Prize 1978, Editor Wilhelm Odelberg, [Nobel Foundation], Stockholm, 1979. N.E. Alekseevskii, A.F. Andreev, A.S. Borovik-Romanov, L.A. Vainshtein, N.V. Zavaritskii, Ya.B. Zel'dovich, E.M. Lifshitz, M.P. malkov, L.P. Pitaevskii, S.I. Filimonov, M.S. Khaikin, A.I. Shal'nikov, and Yu.V. Sharvin, "Petr Leonidovich Kapitsa (Obituary), Sov. Phys. Usp., Vol. 28, No. 1, pp. 108-110, January 1985. Alexei A. Kostenko, Alexander I. Nosich, and Irina A. Tishchenko, "Development of the First Soviet Three-Coordinate L-Band Pulsed Radar in Khartov before WWII", IEEE Antennas and Propagation Magazine, Vol. 43, No. 3, pp. 29-48, June 2001. Lev Landau's group in Moskow (1956). "Diffraction, mathematical theory of" by V.M. Babich, Springer Online Reference Works. Joseph B. Keller, "Geometrical Theory of Diffraction, Journal of the Optical Society of America, Vol. 52, No. 2, pp. 116-130, February 1962. P.L.E. Uslenghi, Electromagnetic Scattering, UCI SL: QC665.S3.E43 1978. B.Z. Katsenelenbaum, "The theory of diffraction. SHF electronics by L.A. Weinstein", Book Review, Physics-Uspekhi, Vol. 39, No. 2, pp. 205, 1996. "Other Soviet Diffraction Works (List). N.N. Voitovich, B.Z. Katsenelenbaum, and A.N. Sivov, "The generalized natural-oscillation method in diffraction theory", Sov. Phys. Usp., Vol. 19, No. 4, pp. 337-352, 1976. B.Z. B.Z. Katsenelenbaum, "The approximability problem of the electromagnetic field", Physics-Uspekhi, Vol. 37, No. 9, pp. 903-913, 1994. "In Memoriam: Aleksei Nikolaevich Sivov", Journal of Communications Technology and Electronics, Vol. 53, No. 2, pp. 238-239, 2008. V.G. Niz'ev, "Dipole-wave theory of electromagnetic diffraction", Physics-Uspekhi, Vol. 45, No. 5, pp. 553-559, 2002. L.A. Wainstein and V.D. Zubakov, Extraction of Signals from Noise, UCI SL: TK6563.V313 1962. P.L. Kapitza and L.A. Wainstein, High-Power Microwave Electronics, UCI SL: TK7835.E3513 v2 1964. L.A. Vainshtein, "Electron Waves in Periodic Structures", Soviet Physics-Technical Physics, Vol. 2, No. 10, pp. 2176-2188, October 1957. L.A. Vainshtein and E.A. Tishchenko, "Wave-tracing and shortwave diagnostics of a cylindrical plasma", Soviet Physics-Technical Physics, Vol. 21, No. 11, pp. 1338-1343, November 1976. Nicolaos G. Alexopoulos, Giorgio Franceschetti, David R. Jackson, and Pyotr. Ya. Ufimtsev, "Virtual rays and applications", Journal of the Optical Society of America A, Vol. 11, No. 4, pp. 1513-1527, April 1994. Yu. A. Kravtsov and Yu. I. Orlov, "Limits of applicability of the method of geometric optics and related problems" Sov. Phys. Usp., Vol. 23, No. 11, pp. 750-762, November 1980. Yu. A. Kravtsov and Yu. I. Orlov, "Caustics, catastrophes, and wave fields" Sov. Phys. Usp., Vol. 26, No. 12, pp. 1038-1058, December 1983. L.A. Vainshtein, "Propagation of pulses", Sov. Phys. Usp., Vol. 19, No. 2, pp. 189-205, February 1976. V.A. Fock, Electromagnetic Diffraction and Propagation Problems, UCI SL: QC670.F6 1965. V.A. Fock, "XXI. New Methods in Diffraction Theory. ", Philosophical Magazine, Ser. 7, V. 39, pp. 149-155, 1948. M.G. Veselov, G.F. Drukarev, and Yu. V. Novozhilov, "Vladimir Aleksandrovich Fock (In Honor of his 70th Birthday", Sov. Phys. Usp., Vol. 11, No. 6, pp. 921-923, May-June 1969. James A. Cullen, "Surface Currents Induced by Short-Wavelength Radiation", The Physical Review, Vol. 109, No. 6, pp. 1863-1867, March 15, 1958. G.D. Malyuzhinets, "Developments in Our Concepts of Diffraction Phenomena (On the 130th Anniversary of the Death of Thomas Young)", Soviet Physics Uspekhi, Vol. 69, No. 5, pp.749-758 September-October 1959. G.D. Maliuzhinets, "Inversion Formula for the Sommerfeld Integral", Soviet Physics Doklady, Vol. 3, No. 1, pp. 52-56, January-February 1958. G.D. Maliuzhinets, "Excitation, Reflection and Emission of Surface Waves from a Wedge with Given Face Impedances", Soviet Physics Doklady, Vol. 3, No. 4, pp. 752-755, July-August 1958. A.V. Osipov and A.N. Norris, "The Malyuzhinets theory for scattering from wedge boundaries: a review", Wave Motion, Vol. 29, pp. 312-340, 1999. "Huygens' principle" by A.G. Sveshnikov, Springer Online Reference Works. Robert Meneghini and John Bay, "Several Maggi-Rubinowicz Representations of the Electric Field", IEEE Transactions on Antennas and Propagation, Vol. AP-30, No. 3, May 1982. H.M. Nussenzveig and W.J. Wiscombe, "Diffraction as Tunneling", Physical Review Letters, Vol. 59, No. 15, pp. 1667-1670, 12 October 1987. Valery E. Grikunov, Giuseppe Pelosi, and John L. Volakis, "Foreword to the Special Issue on Millennium Day of Diffraction Seminars, IEEE Transactions on Antennas and Propagation, Vol. 49, No. 12, pp. 1610-1611, December 2001. Anna Sergeevna Kirpichnikova and Vjacheslav Borisovish Philippov, "Diffraction by a Line of Curvature Jump (A Special Case)", IEEE Transactions on Antennas and Propagation, Vol. 49, No. 12, pp. 1618-1623, December 2001. Vasilii M. Babich, Valery P. Smyshlyaev, Daniel B. Dement'ev, and Boris A. Samokish, "Numerical Calculation of the Diffraction Coefficients for an Arbitrary Shaped Perfectly Conducting Cone", IEEE Transactions on Antennas and Propagation, Vol. 44, No. 5, pp. 740-747, May 1996. S.J. Chapman, J.R. Ockendon, and V.H. Saward, "Edge diffraction of creeping rays", J. Acoust. Soc. Am., Vol. 107, No. 4, pp. 1841-1845, April 2000. T.B.A. Senior and P.L.E. Uslenghi, "Comparison Between Keller's and Ufimtsev's Theories for the Strip", IEEE Transactions on Antennas and Propagation, Vol. 19, No. 4, pp. 557-558, July 1971. Shung-Wu Lee, "Comparison of Uniform Asymptotic Theory and Ufimtsev's Theory of Electromagnetic Edge Diffraction", IEEE Transactions on Antennas and Propagation, Vol. AP-25, No. 2, pp. 162-170, March 1977. Petr Beckmann, The Depolarization of Electromagnetic Waves, The Golem Press, UCI SL: QC670.B44 1968. Craige E. Schensted, "Electromagnetic and Acoustic Scattering by a Semi-Infinite Body of Revolution", Journal of Applied Physics, Vol. 26. No. 3, pp. 306-308, March 1955. K.M. Siegel, J.W. Crispin, and C. E. Schensted, "Electromagnetic and Acoustic Scattering from a Semi-Infinite Cone", Journal of Applied Physics, Vol. 26. No. 3, pp. 309-313, March 1955. Lev Albertovich Weinstein (Vaynshteyn), Open Resonators and Open Waveguides, The Golem Press, UCI SL: TK 6565.R43.V33 1969. Ulice J. Macias, "A Comparison of Computational Electromagnetic Methods for the Prediction of Radar Cross Section", MS Thesis, Report Date: December 1986, 119 pages, U.S. Air Force Institute of Technology, Doc. ID No. AD-A177 718, Wright-Patterson AFB, Ohio; released for public distribution 1987. W.D. Burnside, C.L. Yu, and R.J. Marhefka, "A Technique to Combine the Geometrical Theory of Diffraction and the Moment Method, IEEE Transactions on Antennas and Propagation, AP-23, No. 4, pp. 551-558, July 1975. Ulrich Jakobus and Friedrich M. Landstorfer, "Improvement of the PO-MoM Hybrid Method by Accounting for Effects of Perfectly Conducting Wedges", IEEE Transactions on Antennas and Propagation, Vol. 43, No. 10, pp. 1123-1129, October 1995. P.Y. Ufimtsev, 'Comments on "Improvement of the PO-MoM Hybrid Method by Accounting for Effects of Perfectly Conducting Wedges"', IEEE Transactions on Antennas and Propagation, Vol. 45, No. 9, pp. 1440, September 1997. Ulrich Jakobus and Friedrich M. Landstorfer, "Authors' Reply", IEEE Transactions on Antennas and Propagation, Vol. 45, No. 9, pp. 1440-1441, September 1997. Gianluigi Tiberi, Serena Rosace, Agostino Monorchio, Giuliano Manara, and Raj Mittra, "Electromagnetic Scattering From Large Faceted Conducting Bodies by Using Analytically Derived Characteristic Basis Functions", IEEE Antennas and Wireless Propagation Letters, Vol. 2, pp. 290-293, 2003. Sadasiva M. Rao, Donald R. Wilton, and Allen W. Glisson, "Electromagnetic Scattering by Surfaces of Arbitrary Shape", IEEE Transactions on Antennas and Propagation, Vol. AP-30, No. 3, pp. 409-418, May 1982. V.V.S. Prakash and Raj Mittra, "Characteristic Basis Function Method: A New Technique for Efficient Solution of Method of Moments Matrix Equations", Microwave and Optical Technology Letters, Vol. 36, No. 2, pp. 95-100, January 20, 2003. R. Mittra and K. Du, "Characteristic Basis Function Method for Iteration-Free Solution of Large Method of Moments Problems", Progress In Electromagnetics Research B, Vol. 6, pp. 307-336, 2008. Danilo Erricolo, Stefano Mihai Canta, Harun Taha Hayvac1, and Matteo Albani, "Experimental and Theoretical Validation for the Incremental Theory of Diffraction", IEEE Transactions on Antennas and Propagation, Vol. 56, No. 8, pp. 2563-2571, August 2008. Igor E. Dzyaloshinskii: Background and Interview (P.L. Kapitsa's Institute of Physical Problems, Moscow, Russia). L.A. Vainshtein, "Waves of Current in a Thin Cylindrical Conductor I. Currents and Impedance of a Transmitting Antenna", Soviet Physics - Technical Physics, Vol. 4, No. 6, pp. 601-616, December, 1959. L.A. Vainshtein, "Waves of Current in a Thin Cylindrical Conductor II. The Current in a Passive Oscillator, and the Radiation of a Transmitting Antenna", Soviet Physics - Technical Physics, Vol. 4, No. 6, pp. 617-626, December, 1959. L.A. Vainshtein, "Current Waves in a Thin Cylindrical Conductor III. Variational method and its Application to the Theory of Ideal and Impedance Conductors", Soviet Physics - Technical Physics, Vol. 6, No. 1, pp. 19-29, July 1961. L.A. Vainshtein, "Current Waves in a Thin Cylindrical Conductor IV. Input Impedance of an Oscillator and the Precision of the Formulas", Soviet Physics - Technical Physics, Vol. 6, No. 1, July 1961. P.L. Kapitsa, V.A. Fok, and L.A. Vainshtein, "Static Boundary Problem for a Hollow Cylinder of Finite Length", Soviet Physics - Technical Physics, Vol. 4, No. 10, pp. 1077-1087, April 1960. P.L. Kapitsa, V.A. Fok, and L.A. Vainshtein, "Symmetric Electric Oscillation of an Ideally Conducting Hollow cylinder of Finite Length", Soviet Physics - Technical Physics, Vol. 4, No. 10, pp. 1088-1105, April 1960. B. D. Tartakovskii, "Symposium on Diffraction of Waves", Soviet Physics Uspekhi, Vol. 4, No. 3, pp. 511-520, November-December 1961. B. D. Tartakovskii, "Second All-Union Symposium on Wave Diffraction", Soviet Physics Uspekhi, Vol. 5, No. 6, pp. 1006-1023, May-June 1963. Yu. A. Kravtso, C.M. Rytov, and V.I. Tatarskii, "Statistical problems in diffraction theory", Sov. Phys. Usp., Vol. 18, No. 2, pp. 118-130, 1975. V.G. Veselago, "The Electrodynamics of Substances with Simultaneously Negative Values of ε and μ", Soviet Physics Uspekhi, Vol. 10, No. 4, pp. 509-514, January-February 1968.